The Renaissance Centre was originally built to house the Erie Trust Company in the early 1930s. The Erie Trust Company had become the main banking institution in the mid-1920s, and built the Erie Trust Company Building in order to expand. The building was completed in 1925 with the help of New York City architectural firm, Dennison and Hirons, and cost $2 million dollars to build. In 1933 the effects of the Great Depression would cause the Erie Trust Company to go bankrupt and close its doors. The National Bank and Trust, a formation of the bankrupt Erie Trust Company and another closed bank, began occupying the building. 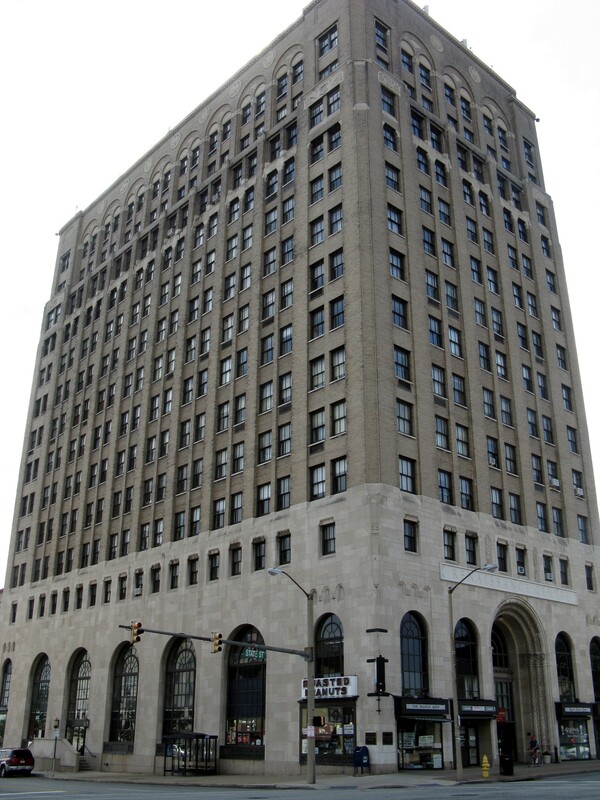 In 1943 the Erie Trust Company building was state auctioned and bought by local real estate company Tenth Street Building Corporation for $377,000. The building was then renamed in 1945 after the company’s president, G. Daniel Baldwin. National Bank and Trust was taken over by First National Bank in 1951, which remained in the Baldwin Building until the 1980s. Throughout the 1970s and 1980s the Baldwin Building experienced a decline in occupancy, and was put up for auction once again in June 1996. The Tenth Street Building Corporation donated the Baldwin Building to the Great Erie Charity Golf Classic, which was then sold to local developer Tom Kennedy. The building was then renamed the Renaissance Centre, a name which encompassed the effort of the developers and community to revive the building. As a result, the Renaissance Centre was restored and listed on the National Register of Historic Places in August 2000. The fourteen story building is now host to retail shops, a restaurant, a theater, non-profit agencies, government offices, and independent business owners. It also has a skyway connection to a five story parking garage. It is still prized as Erie’s tallest building.